Sunset TankerTime, Second Sundays, 5 pm – midnight, May, June, July, August, September, now with jam of Mediterranean music! Relax, sketch, or have a meeting on our main deck set with hammocks, tables and chairs. Bring dinner or cocktails. Read books from our maritime library while you are aboard. This year, we introduce a musicians’ jam “WaterStories of the Wine Dark Sea” with Mediterranean-themed music. This is the first phase of Mediterranean-themed programs that will reflect the major role that Mediterranean immigrants play in Red Hook’s history and relates to our e-museum Red Hook WaterStories. The ancient poet Homer called the Mediterranean waters “wine-dark,” and we name the series in his honor. Embark with PortSide on a cultural journey around the Mediterranean, its colors and cultures. Share and discover stories, songs, and struggles. Bring an oud, a guitar, or clapping hands. Bring your family histories of Mediterranean immigrants who lived and worked in Red Hook to add to Red Hook WaterStories. To get there:Take our SBK NYC Ferry to Red Hook/Atlantic Basin. Exit the landing and make a left to get to the historic Mary A. Whalen, moored in Atlantic Basin, to the left of our dock. 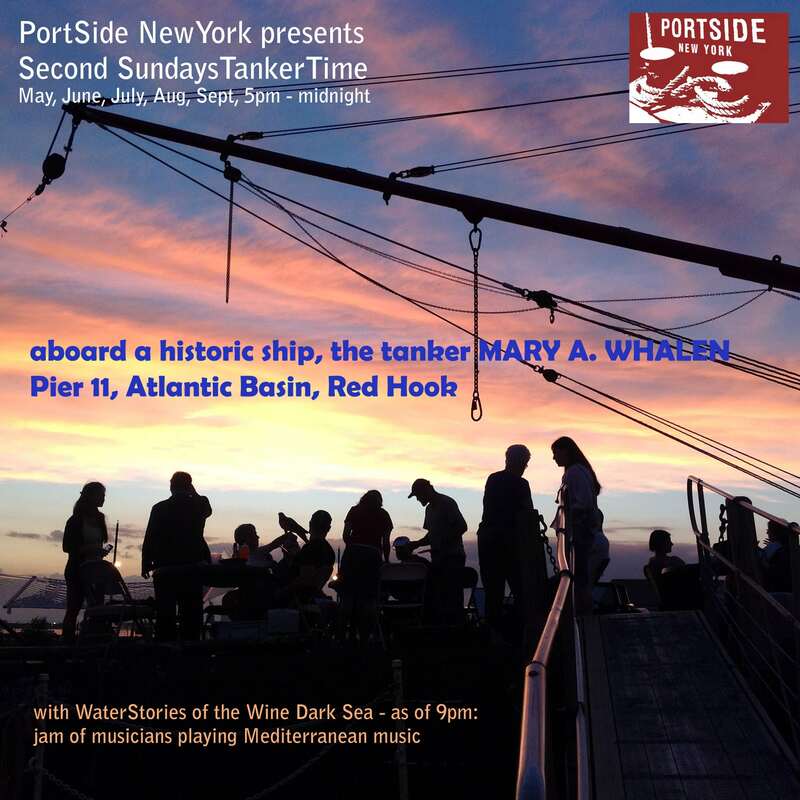 Visit http://portsidenewyork.org/tankertime for more information.